We have a couple of robins who pop by into the hedge. I am not often quick enough to catch them with the camera as they don't stop long - I think they have a nest in the hedge on my neighbour's side. But this one was singing a happy song, so a nice way to welcome a Monday morning. Beautiful capture with the sunlight on this little chap. So very sweet singing in the sunlight! Lovely light. 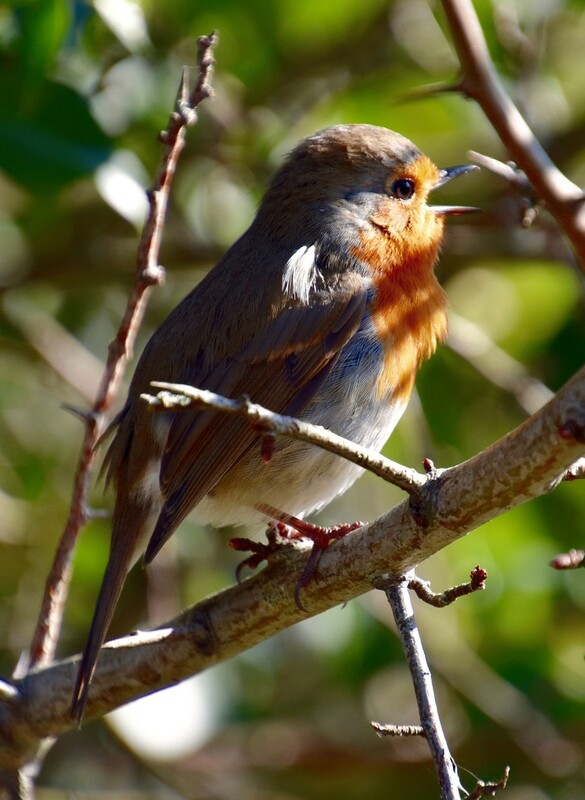 I love to hear the robins singing!! Wonderful, and in Full Song. He does look rather jolly. Probably very happy that spring is here. Beautiful shot, love the Robins song. Lovely capture! Thanks for the kick in the pants to get posting again! Such a beautiful capture. Has to be a fav. Beautiful timing and capture. So much detail! Great timing and a sweet capture. I just love the Robins there!! Very different from ours!! If a bird can look happy this one sure does. Great details. He is enjoying the morning sunshine :) Nice sharp focus. They have a pretty little sound - ours look so different. Fav. close up of this beautiful robin bird. Love that you caught Ms.Robin mid-song! Great shot! Ah, a sweet singing bird . . . so lovely to see, and even lovelier to capture! What a little cutie. Love this shot. What a beautifully clear shot - and how nice to have Robins in your hedge!! Wonderful close up and lighting! Gorgeous. Amazing light and a wonderful close-up. fabulous clarity and colors.... but those light and shadow bars make the shot in my eyes! This is adorable! A darling capture. Where does the time go?!? One minute I feel caught up and the next weeks behind...yikes! Fav.